DDFamous Reviews - Is DDFamous Reliable or Another Scam? Disclosure: We may be compensated when you make a purchase via our link. Click to learn more. IGReviews is a free and professional review site that receives compensation from some of the companies we review when you make a purchase through our link. This does not affect our reviews which are our own independent opinions based on thousands of hours of research and testing. It is in our best interest to ensure we refer you to the best companies as we do not receive compensation if you are not satisfied with a company we referred you to (ie. you request a refund or cancel your order). If you find our reviews helpful, please make a purchase through our links to support our work. Thank you! We ordered 1,000 Instagram Followers from DDFamous to test out their service, and get a real feel for the followers they will deliver with this larger order. The followers we got started arriving in a reasonable amount of time, and were delivered in full the day after we placed the order. Their customer support responded very quickly, and helped us out with our questions. They also have good protections in place, outlined in the Terms of Service, in case anything goes wrong with your order. With these points in mind, we would certainly recommend their services if you're looking to boost your social proof on Instagram. DDFamous offers Instagram social signal boosting services, including followers, likes, and video views. All of these services help people like yourself become more popular on Instagram. They've been around since at least 2016, and are based in Spain. This site is solely focused on Instagram alone, but it's part of a larger network which covers other social media as well. DDFamous offer good prices, good warranties in case anything goes wrong, and good customer service. Overall, they are a reliable provider. DDFamous offers a few different plans to help you boost your reputation on Instagram - Followers, Likes, Views, and Auto-Likes. Their Auto-Likes service will automatically send likes to every post that you publish. We reviewed the terms and conditions sections on the DDFamous website and made a few comments on their status below. To find out more details on these, then please toggle the sections to see what we thought! DDFamous has a nicely-laid out Terms of Service which quickly points out that their service is for promotional purposes only, and that their services will not interact with your account beyond what you're paying for. They also absolve themselves from any repercussion which could result from using their services, which is a standard industry practice. They state that no information will ever be sold to a third-party. This guarantee isn't listed anywhere on their site, but we have had their customer support team verify it with us via email. If you need to get in touch with DDFamous for any reason, you'll have two options. First, you can send a message directly to their email at support@ddfamous.com. The other option is to scroll to the bottom of their site and click 'Customer Support,' which takes you to a contact form page. Before we ordered, we sent DDFamous some questions to see how fast their customer support would respond, and how helpful they would be. They responded very quickly, in less than two hours, and they went through all of our questions one by one. Overall, an excellent customer support interaction. 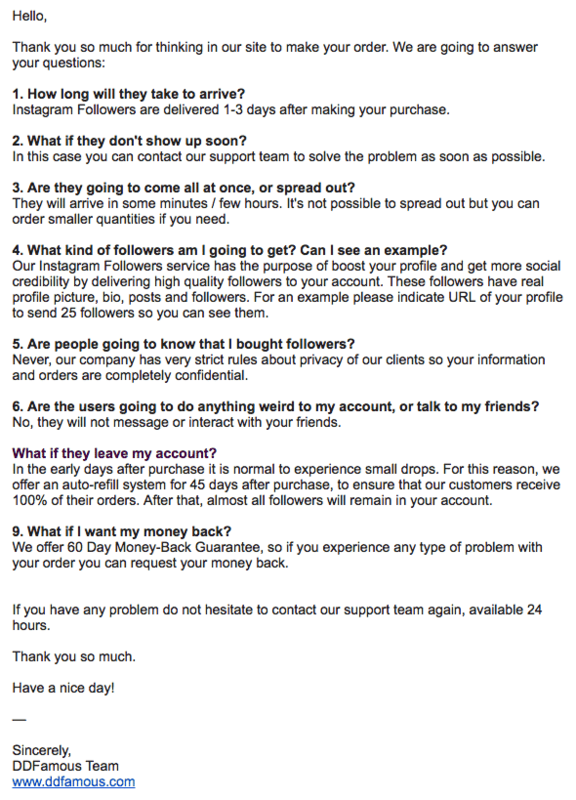 "Instagram Followers are delivered 1-3 days after making your purchase." "In this case you can contact our support team to solve the problem as soon as possible." What kind of followers am I going to get? Can I see an example? "Our Instagram Followers service has the purpose of boost your profile and get more social credibility by delivering high quality followers to your account. These followers have real profile picture, bio, posts and followers. For an example please indicate URL of your profile to send 25 followers so you can see them." Are people going to know that I bought followers? "Never, our company has very strict rules about privacy of our clients so your information and orders are completely confidential." Are the users going to do anything weird to my account, or talk to my friends? "No, they will not message or interact with your friends." What if they leave my account? "In the early days after purchase it is normal to experience small drops. For this reason, we offer an auto-refill system for 45 days after purchase, to ensure that our customers receive 100% of their orders. After that, almost all followers will remain in your account." "We offer 60 Day Money-Back Guarantee, so if you experience any type of problem with your order you can request your money back." After we ordered, we sent them another set of questions to see if they'll treat a paying customer any differently. Once again we got a very nice response, answering all of our concerns one by one. No problems here. "They will arrive in some minutes / few hours. It's not possible to spread out but you can order smaller quantities if you need." What if any of my followers leave, how long will they last? "As we indicated some time before, we offer an auto-refill system for 45 days after purchase, to ensure that our customers receive 100% of their orders. After that, almost all followers will remain in your account. In the event that any follower is lost after this period, they will be added again." What if Instagram removes them? "After answering this question we want to let you know that we use safe and proven tactics to prevent our followers from being eliminated. As we indicated in our first answer, we will refill any lost followers." "At this time we are not offering discounts because our philosophy is to have some of the lowest prices on the market. Due to this reason, we can not offer extra discounts." Can I order any other services to go along with my followers? "Sure! You can buy Auto Likes to your profile." We can definitely recommend the services of DDFamous if you want to boost your social proof on Instagram. Their service was delivered as promised, the followers we received were of a good quality, and their customer support was quite good. They checked all the boxes for a quality company in any field. Our Instagram followers began arriving quickly, right on the same day we bought them. The entire order was finished within 24 hours. The Instagram followers we got from DDFamous looked pretty good. They had profile photos, unique bios, and most of them had quite a few posts of their own. Overall, they looked pretty much like any real Instagram users, though we observed that they were mostly non-English speaking accounts. Our tests showed that the retention rate of our followers was very good. We didn't lost any followers from our account during the testing period. 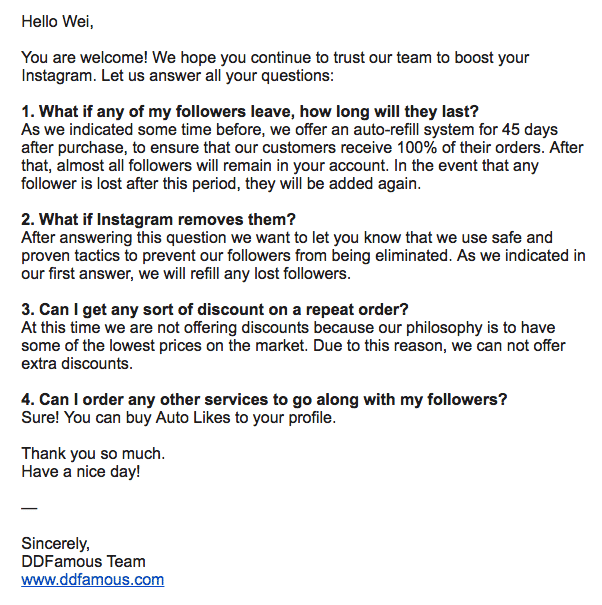 We ordered 1000 Instagram followers from DDFamous to test out the quality of their follower service. Overall, we were quite happy with the results we found as the followers that were delivered to us by DDFamous looked very much like real Instagram users. They had photos, bios, and other hallmarks of authentic Instagram profiles. Their customer support was also great, and responded pretty quickly to our questions with clear information which helped. They have both of the protections that we always look for in companies: a money-back guarantee and a retention guarantee. All of the things they do well, from the followers they provide, to their great looking website, and certainly including their customer protections; we recommend DDFamous! The customer support at DD were friendly and explained in detail the different services they offer and they assured me i would get my followers in time since i had a deadline to beat. I am greatful to them since they delivered and i got all the credit for the increased followers at work. If you are looking to grow your Instagram followers this is the place.guareanteed results no disappointments so far. The followers i ordered for arrived in less than 24 hours and what impressed me most was the quality of followers which was excellent.What counts in this business is authenticity, the more authentic you look the more credible you become and ddfamous provided me with exactly what i wanted. The customer service at dd was able to respond to all my doubts, giving satisfactory responses. They as well delivered just as they had described the service. I couldn't ask for more. This company virtually has no reviews on Google. After trying them out, I can confidently recommend their services to everybody else. Great service! DDFamous is another great option for an SMM Manager like me. The prices are great for promoting clients who are on the "budget" side of things but still have great quality service to deliver. I'm happy I found DDFamous. DDFamous is definitely a cheaper option compared to the rest. Other SMM providers that offer 100 Instagram Followers are priced at $3.00. At DDFamous, you can get the same amount of Followers and the same quality at a lesser price of $2.49. Value for your money indeed. There were drops of IG Followers a few days after my order was completed. I contacted their customer support and they refilled it. They are really trustworthy. I'm glad I worked with them. The Instagram Followers I bought look real to me. They are active with a few private accounts. Not bad at all. The followers and likes I bought from DDFamous looks real and active. I like it already. I will definitely order more.